Beginning with the class of 2017, all students in Washington state will be required to perform community service in order graduate from high school. 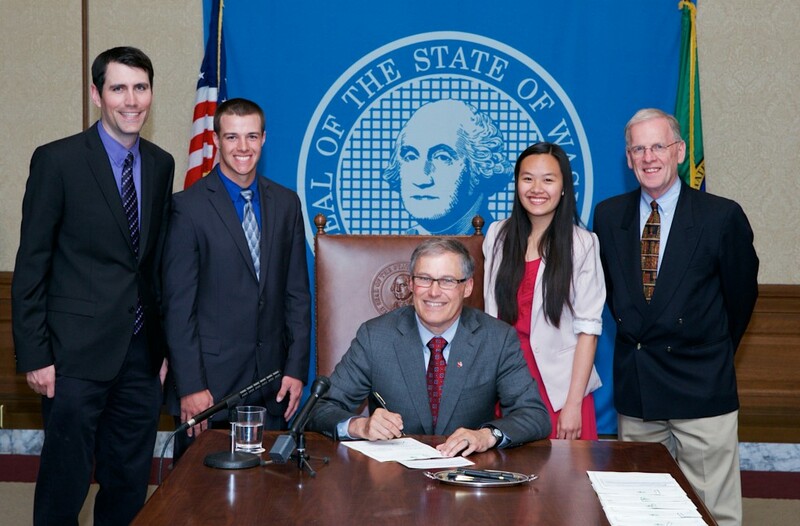 Governor Jay Inslee signed state-wide legislation to enforce the requirement in March (pictured left), which puts Washington at the forefront of a greater push for community service requirements across the United States. School districts across more than 35 states require some form of community service for graduation from public high schools. This is up from only 7 states in 2001. The idea of making service an essential component of student learning is by no means new. The idea of learning by doing was a central component of John Dewey’s educational philosophy around the turn of the 20th century. According to Dewey, education happens best when students can connect new learning to personal experience. Middle and high school students who participated in service-learning tutoring programs increased their grade point averages and test scores in reading/language arts and math and were less likely to drop out of school (Supik, 1996; Rolzinski, 1990). Elementary and middle school students who participated in service-learning had improved problem-solving skills and increased interest in academics (Stephens, 1995). Middle and high school students who engaged in quality service-learning programs showed increases in measures of personal and social responsibility, communication and sense of educational competence (Weiler, et. al., 1998). Students who engage in service-learning feel that they can “make a difference” (O’Bannon, 1999; Cairn, 1999). However, despite these proven effects, the addition of community service requirements has not been uncontroversial. Parents and students across the United States have filed lawsuits to fight what they see as “involuntary servitude” being imposed on young people. They raise some legitimate questions: Does it really make sense to “force” someone to volunteer? Will students come to see service in a negative light? What if students feel alienated from or distrust the community they are required to “serve”? Others propose a mandatory 2-year service requirement to take place after young people graduate from high school, claiming that long-term, full-time work in the public interest would do far more good than one-off trash pickups or clothing drives. As we take another look at stage 5 of our framework (students as world changers), it makes sense to think about the increasingly important role of direct service in education. Whether our schools require service or not, it’s a learning tool we cannot ignore.